Charlie and Gary tied the knot during their New Year’s Eve wedding. With the two traveling in from New Zealand, and their families traveling in from the UK and across the US, it was truly a beautiful day filled with the love of so many of their loved ones. It is rather ironic that they made their way back to Florida after finding the perfect rental home by chance, as the two actually met in Florida as well, specifically at the Florida Institute of Technology in Melbourne, Florida. Gary and Charlie were both incredible athletes at their school, with Charlie playing volleyball and Gary playing soccer. In addition to playing soccer, Gary also was the volleyball team’s ball boy. Charlie took notice of Gary and asked for one of her teammates to get his number for her. Soon after, the two began dating on September 7th of 2013 and a romance ensued. After dating for a few years, moving across continents to be with one another, and building a life together, Gary knew it was time to pop the question by asking for Charlie’s hand in marriage. Planning a weekend getaway, Charlie was excited for the spontaneous trip, but a little nervous about their accommodations. Gary made her to believe that it was well, a dump, but a great location central to the activities he had in store. Along for the ride, Charlie trusted him and off they were to their not so fabulous accommodations but a great weekend getaway together. Turning onto the last road to their destination, the winding driveway felt endless as the excitement built. Completely in shock, Charlie explained that the supposed dump of a place, was anything but, as it was a magical estate with the most beautiful views. Gary definitely opened up their trip with a surprise for sure! Fast forward to their wedding day, the two envisioned a wedding filled with fun! Their wedding day theme was based off of the Great Gatsby with colors of silver, grey, white, and navy blue. Closing a chapter of their lives and opening the next, Charlie and Gary truly just wanted to enjoy the moment along with all of their friends and family who traveled in to be with them. I must say that Charlie and Gary’s day truly was fun and even more amazing than they could have thought it would be! Arriving a bit early, we were greeted by Charlie’s aunt who had originally found us for Charlie’s big day. Leading us up the driveway to the stunning home where their wedding reception would be taking place, it was absolutely jaw dropping. Greeting Charlie when we entered, I had her and her girls wrap up hair and makeup while we captured her details. Incorporating a few party props was the perfect way to bring in the New Year’s Eve vibe! While the guys were still arriving and showering, we stayed with the girls for adorable robe shots, Charlie by her wedding gown, and of course a few sweet photos with Ace, her pup. 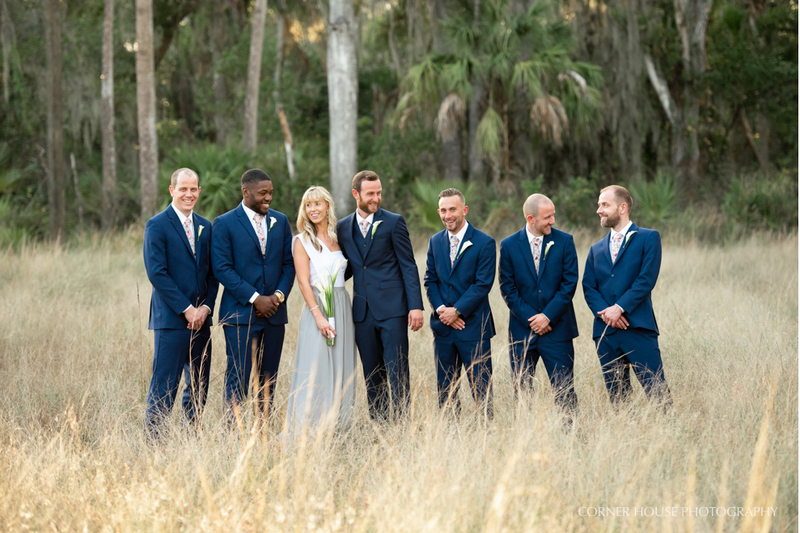 In between robe shots and putting on the dress, we captured Gary and his guys, along with Carrie his groomswoman, looking dapper as ever outside. Before heading over to the church, a few bridal portraits with Charlie by herself and with her mom were an absolute must! Heading over to St. Stephen’s Catholic Church, we were yet again in awe of the beautiful location. The stunning church was only a 15 or so minute drive, so we quickly set up to prepare for our couple’s ceremony to begin. After the service concluded, we captured family portraits on the alter. With the ceremony wrapping up slightly earlier than expected, I added in an impromptu grand exit for our couple. Asking guests to make a walkway, we had Charlie and Gary come out of the church, cheered on by their friends and family, before departing back to the rental home. Leading up to the big day, Charlie and her aunt were scooping out possible spots for formal portraits of the bridal party and newlyweds. Between a lake that wasn’t quite as nice as expected and an orange grove that might not have had the best lighting, we were over the moon to find a grassy field right in front of the venue hidden by a line of trees. Charlie must have thought I was crazy at first, as I was raving about how amazing the photos would look in what seemed to just be a random field. Sure enough between the perfectly setting sun behind the field, and stunning bridal party, the formal portraits in the seemingly plain field were by far my most favorite shots of the day. Everything was just too perfect! After capturing our bridal party, we had them head off to join the rest of the wedding party for cocktail hour, while keeping our newlyweds back for a few gorgeous newlywed portraits! Behind the home, a reception tent was set up with tables and chairs ready for guests to enter. Welcoming guests in a receiving line as they entered the tent, Charlie and Gary had the opportunity to enjoy a few moments with each person who came to celebrate in their big day. Reception entrances, followed by toasts, followed by formal dances after dining, followed by tons of dancing filled the night before we said our goodbyes. Wishing our sweethearts a brilliant 2019 and many more years to come as officially Mr. and Mrs.!